If you are interested in how life was in the Middle East before the Islamist and their supporters' wave took over with their destructive methods? Do you want to know more about the background of the conflict in the Middle East? Much history is conveniently forgotten. This book will bring back some happy memories of a cosmopolitan vibrant time in Baghdad,Iraq and also in Damascus, Syria when people of all backgrounds, cultures and beliefs lived and worked side by side in peace. This information is interwoven into my story of the first two decades of my life. A different viewpoint from a young Christian woman's mind. One of the few last survivors of her generation. Once Upon a Time in Baghdad consists of a series of voices that join into a colorful mosaic about life in Baghdad as it once was and could be again. 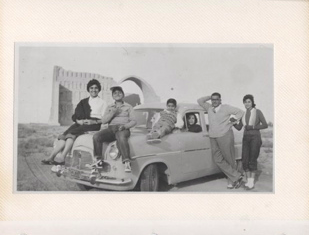 Seen through the eyes of a young Christian woman the Baghdad of the nineteen forties and fifties is interwoven with flashes of the recent events of war struggle and occupation, then again historical stretches are inserted telling of the Arab heritage in grand sweeps. The storytelling format is non linear, the different fragments however create a weave not unlike the intricate patterns of an oriental carpet with foreground and background merging and alternating, in a dance of different colors, voices and intonations. The young woman's Baghdad is a multicultural city, with a life rich in different trajectories merging. Christian, Jewish and Moslem life interweave as she herself offspring of Indian and Syrian parents, a not uncommon cosmopolitan figure in an Arab city rich with influences, cultures and traditions meeting in ways that are familiar but also different. It shows a way of life which in the Middle East has sadly vanished and given way to increasing monochrome tendencies. Here's a picture of my youngest brother Johnny, a musician, with one of his idols Freddie Mercury in Montreux at the yearly Jazz Festival. Johnny was born in Baghdad and was one year old when he arrived in the UK. I want to include him as well even though he has no personal memories of Baghdad. He feels so left out as it is of our family drama! This foto was taken in 2010 and he lives in his hometown London.